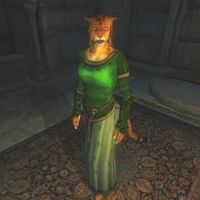 Dro'Nahrahe is a Khajiit warrior, and the steward of Castle Bravil. Unfortunately, a serious bug causes her to travel towards Bruma every day. This makes her easy prey for the wildlife and she will often die a premature death somewhere along the Green Road. Because of Count Regulus Terentius' lack of interest in the welfare of the county, Dro'Nahrahe has much more responsibilities than just being a steward. So much so, that she barely has the time to talk to anybody and has more or less taken over his obligations. She sleeps in the northwestern room of the private quarters every night between midnight and 6am. After waking up she relaxes a bit and strolls around near her room for two hours. At 8am, the bug sets in and she leaves Bravil and travels along the Green Road for four hours. When she reaches Robber's Glen Cave at noon, she turns around and heads back to the castle. When she gets back, she once again enters the private quarters and spends the afternoon wandering around. At 8pm, she will enter the lord's manor and eat dinner with the Count and Drels Theran until midnight when she heads back to her bed. She wears a set of green upper-class clothing, a brocade doublet with silk garment and a pair of velvet shoes. She carries the key to the Castle as well as the key to the interior. She also carries a large sum of gold. If you manage to corner the busy steward she will say: "Dro'Nahrah [sic]. I'm Count Bravil's steward. I'm sorry, but please, I have too much on my mind to talk." And when asked about Bravil, she will reveal the embarrassing truth about Count Regulus Terentius: "The Count is too preoccupied with his pastimes to spend time on county affairs. So the burden lies on me." Dro'Nahrahe's editor id is "DroNahrah", and two of her AI packages also use that name. Combined with the dialogue error, it seems this may have been her intended name. This issue has been addressed by version 2.0.0 of the Unofficial Oblivion Patch; her name gets effectively changed to Dro'Nahrah. According to the target data for her midday AI package, she is supposed to attend Regulus Terentius in the North Wing of Castle Bravil's Private Quarters between 8am and midday. In fact, the location data tells her to head to Bruma Castle during that time, which is why she suddenly leaves town. This often results in her dying in the wilderness. This bug is fixed by version 2.0.0 of the Unofficial Oblivion Patch. Between midday and 2pm, she is supposed to visit the Lucky Old Lady, and wander around near the statue. The conditions for this behavior seem to be designed to keep her away from the statue while the Dark Brotherhood descend to the Night Mother's crypt, but they are incorrect. The condition specifies that she only visits if Following a Lead hasn't reached stage 30, and Honor Thy Mother is at least at stage 100: in other words, you must have completed the Dark Brotherhood quest line but not yet found the Traitor's Diary. Since this is an impossible combination, she never makes the visit. This bug is fixed by version 3.3.6 of the Unofficial Oblivion Patch.